Large Rainforest Resort, Offering Numerous Activities & Amenities. 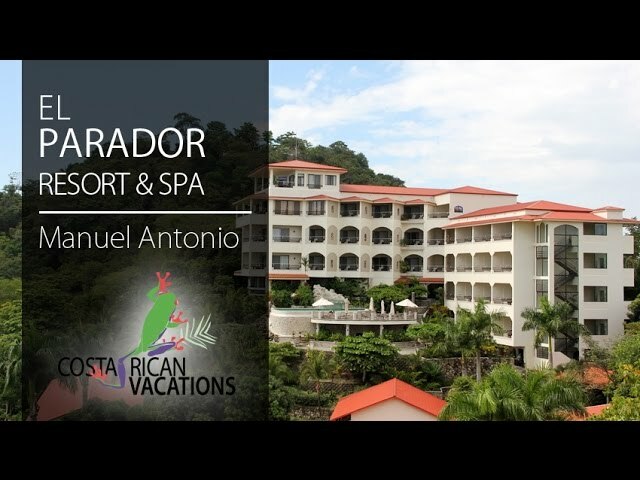 Set above the rainforests of Manuel Antonio, El Parador Resort & Spa is a favorite among families looking for a full-service resort with plenty of dining options and activities, located near the world-famous Manuel Antonio National Park. Holding multiple World Travel Awards and the Costa Rican Tourism Board’s highest Level 5 Certificate of Sustainable Tourism, El Parador Resort & Spa marries the old-world charm and European-inspired ambiance of a traditional Spanish parador with the warm Costa Rican hospitality of a sprawling tropical oasis. El Parador is adjacent to the sheltered cove of Playa Biesanz and just minutes from Manuel Antonio National Park, the neighboring fishing village of Quepos, and the local airport. The massive resort consists of 121 rooms set along 12 acres of lush rainforest. Guest rooms and suites are equipped with A/C, cable TV, safe deposit box, hairdryer, minibar, and coffeemaker. Hotel amenities include a fitness center, spa, gift shop, tennis courts, mini-golf course, yoga classes, three ocean-view swimming pools (including the 24-hour adult-only pool), nature trails, complimentary WiFi throughout the property and rooms, and free shuttle service to the public beach with scheduled times throughout the day. Daily buffet breakfast, with a thoughtful mix of healthy options alongside family favorites, is served at La Galeria Restaurant and included with your stay. Enjoy everything from fresh tropical fruits, juices, cereals, pastries, pancakes, or waffles, to a hearty Costa Rican “gallo pinto’ and cooked-to-order omelets, while taking in the beautiful vistas of the bay from the La Galeria’s open-air terraces. From the property, you might witness the awesome spectacle of migrating whales, while just a bit further south the unspoiled beach of Matapalo plays host to another of nature’s miracles: the annual nesting of turtles, which usually occurs between July and December. El Parador has several restaurant options including the elegant La Galeria and Don Juan Bar, the more casual El Quijote and Sancho Panza, the La Fargata Restaurant & Tapas Bar, El Galeón and Sushi Fune, and La Reina private dining area. The selection of garden, jungle, or ocean-view rooms and lavish suites dot the sprawling grounds, affording both family-friendly and couples-only romantic options. Scenic jungle trails shared by lazy sloths, giant iguanas, and frolicking titi, whiteface, and howler monkeys lead to jagged panoramic cliffs overlooking the ocean.